Let me get something out there now. I want to make Amy Adams my wife. She's insanely beautiful and has a quality about her that just seems so real and genuine that you can't help but be drawn to her. She has this fantastic ability to be so kind and compassionate in every single role and it's truly something I've never been able to figure out. And of course, that is exactly the case in Sunshine Cleaning. 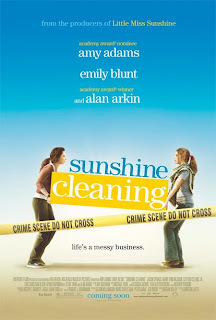 Sunshine Cleaning follows the story of 2 sisters, hard-up for cash and looking to mend a rather strained relationship, they decide to start an....unusual cleaning business. Through a connection within the local police force they begin to take on jobs cleaning up crime scenes. They witness some truly gruesome stuff, learn the ropes, climb the ranks and learn a little something about each other along the way. Much like its cousin, Little Miss Sunshine, this is a film that's about this but really about that. From the trailers Sunshine Cleaning looks like a comedy about a struggling family that goes into an odd line of work. It is really about an odd line of work and its impact on said family. There's some great moments of heartwarming (and heartbreaking) family drama as we come to know these characters, but the heart of this film lies in the crime scenes. When Amy Adams sits with a woman who's husband has just committed suicide as she waits for her son-in-law to pick her up we can feel her (and our) heart break for this woman. There's a beautiful melancholy about this film that is not ill-intentioned or wanting to depress us for the sake of depressing us. We feel sad for these characters because we want to and because they feel so real and genuine. Much needs to be said about the chemistry of Adams, Emily Blunt and Alan Arkin during their scenes together. They are quite memorable and Arkin solidifies his spot as "guy I'd like to have play my grandfather".